Since the end of 2012, Vodafone offers its new LTE Internet Surf Stick K5006-Z together with the LTE mobile tariffs for notebooks. 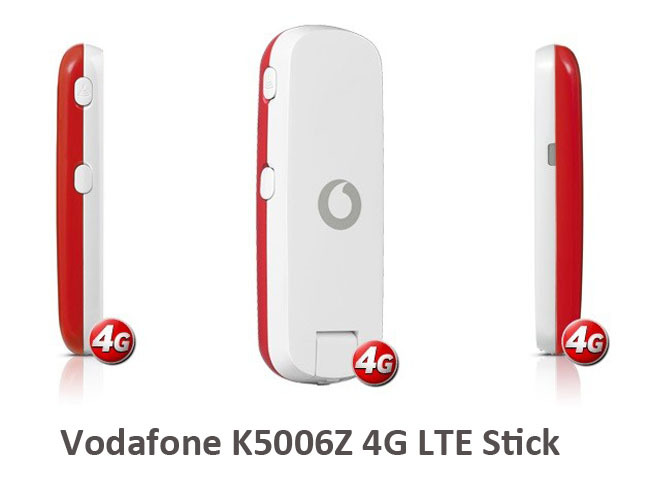 Vodafone K5006-Z LTE stick is the successor to the Vodafone K5005 surfsticks. However, the K5005 is from manufacturer Huawei and K5006z is from the manufacturer ZTE. They are both LTE Category 3 USB Stick supporting peak download speed up to 100mbps. Like Huawei K5005, Vodafone K5006z also has rotatable USB connector with the customized logo and software. Vodafone K5006-Z supports all the LTE frequency bands offered by Vodafone. And the unlocked ZTE K5006Z could work around in all the European countries. If Vodafone LTE network is not available somewhere, then the K5006-Z will automatically return to the HSPA or UMTS mobile communications standard. It would automatically choose the fastest network and let user access internet in possible high speed. The Vodafone USB Stick K5006-Z LTE is a very good stick for all LTE new entrants. What’s more, there is already another successor in sight. The Internet Stick Vodafone K5007! The K5007 is already available at Vodafone Portugal. The K5007 is identical with the Huawei E3276. It’s a LTE Category 4 USB Stick with support of up to 150mbps. If you want higher speed, don’t miss it, it’s amazing.